Life of a Catholic Librarian: Tea Time with Tifany #89 - Spring crafts & fiction reading! 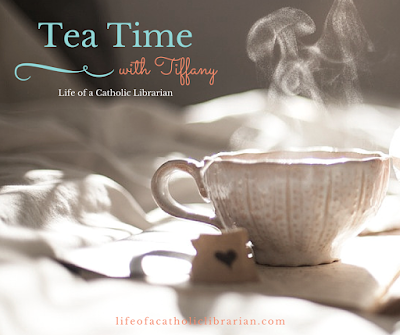 Tea Time with Tifany #89 - Spring crafts & fiction reading! Today I'm talking spring knit-alongs and lots of cozy mysteries. Cozy? I love cozy things! Join me! Harmony trilogy (used to be available for Kindle for 99 cents, but not anymore :( Keep your eyes peeled! In the meantime, it's available from third party sellers in paperback). Hannah Swensen/Murder She Baked mysteries. Do I have any knitters joining in the knit-along? Any other spring crafts ongoing with you? Do you love cozy mysteries as much as I do? I'd love to hear from you! I've been enjoying watching the the Garage Sale Mysteries and the Aurora Teagarden Mysteries. I caught a cold so I spent yesterday a large part of yesterday watching movies I had recorded. I haven't read as many cozy mysteries as I've watched the movie versions of but I have enjoyed those that I've read. I'm glad spring break is this week at one of the libraries I work for since I should be able to watch some movies I've recorded. oh squeal! So happy that you're watching along with me. :0 I recorded a BUNCH this weekend because they were having a marathon, lol!